If you are a book lover or know someone who is, this little book – I'd Rather Be Reading - will be perfect. 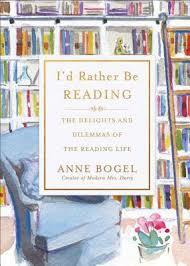 Anne Bogel is a blogger (Modern Mrs Darcy). On the basis of reading this book I'm now going to follow her. This book is a series of little essays on the delights and dilemmas of book lovers – such as what to read next, whether to start a book journal, and the benefits/risks of re-reading old faves. I have now been inspired to create a book journal via Pinterest for books I read but don't blog about. Sometimes it's to do with their content, other times just not interesting enough. Haven't checked Anne's site in ages, looks like a good book. Thanks for reminding me about her. I'll check out the link too. Funny how all we do is read and then we read books and blogs by people who all they do is read! The podcast is also very entertaining. I'm not normally interested in short story books but this sounds like something different, I'm sure I'll love it. Thanks for the recommendation.